I can see them clearly through the kitchen that has almost no walls in this Mexican restaurant in Homestead. His sister is skinny but with curves too. The light is better in this restaurant than the one we are used to going to. And the eggs are more properly cooked, with the yolks unbroken and sunny yellow. The beans carry the flavor of good lard. A tamale is a simple thing, often times the blandest thing. But this one contains homemade braised and then crisped-up pork. It delivers a firm kiss of texture, which differentiates it from the supple, smooth casing of the gentle corn mush. The skill with which the sister cuts those potatoes makes me feel confidence in this place overall and that she is smiling while she does it, even though this is Sunday morning and probably her seventh day of work this week. After careful deliberation, I've decided that the best food of all in this house is the corn tortillas! The simplest things are almost always the best way to determine the quality of almost anything, certainly a restaurant. The tortillas smelled of corn. That sounds simplistic, but so many commercially made tortillas have dulled our expectations of home-made and hand-made things. And these tortillas were clearly made by someone's own hands. I asked the young girl if they made the tortillas there. She said “yes,” and with her head, she pointed to the woman in the back and said "she makes them, Gloria, my mother. Tortillas morph into different names when they are applied differently. The Pupusas are one. 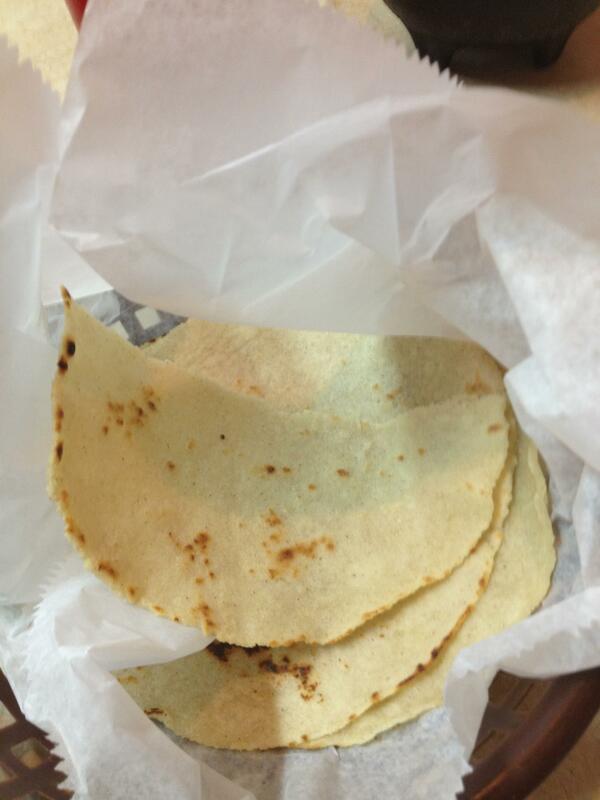 They are a traditional Salvadoran dish made from slightly thicker corn tortillas, (hand-made of course!) and filled with various variations on cheese, pork and/or re-fried beans. Tostadas are another performance artist for the reliable tortillas. Here the tortillas act as an open-faced sandwich. Although a tad trickier to eat than the simple taco, I love the variations of textures attainable when the tortilla is not almost shut. Flautas are pretty, little, cylindrically shaped examples of the way a tortilla can be used. “Flautas” translates as ‘flutes’ and the music they make will make you want to eat them in a cantina with a mariachi band! My wife, Janet, makes her own version of Enchiladas. It brings a smile to my face to see how authentically she does them. You see when she was 18, I took her to her first Mexican restaurant and she was so insecure about the foreign sounding food that she ordered a grilled cheese sandwich off the children’s menu. Times have changed for Janet! I love the name of the ones called “Gorditas” or “little fatties.” They are of pure Mexican birthright and are named, not so hard to guess why, because they are a bit overstuffed. Alas, at the moment... I am not? And all of this talk of such things has fueled an immense need to go out in search of, you guessed this as well, Corn Tortillas! Preheat oven to 375 degrees. Place the potatoes in a roasting pan in the oven for one hour until tender when pierced with a knife. Cool until they are manageable, and peel them, discarding the skins. Reserve. Combine one tablespoon of olive oil and one tablespoon of butter in a medium skillet and set over medium-high heat. Add the onion and sauté for about a minute. Add the sugar and the vinegar and continue to sauté for about four minutes until the onions begin to caramelize and are completely soft. Add the jalapeño and continue to sauté one more minute. Remove from the heat and reserve. Add the remaining tablespoon of oil to a sauté pan and sauté the cabbage until it wilts, about two minutes. Season with salt and pepper to taste. Mash the potatoes with the roasted garlic and remaining butter. While the potatoes are still hot, stir in the cheese, onion, poblano and the cabbage. Season with salt and pepper to taste. Pour enough oil in a 10-inch sauté pan to a little more than cover the bottom of the pan. Get the oil hot over a medium-high heat. When it is hot, place a tortilla shell in the pan and let it crisp for about five seconds. With the tongs flip the tortilla over to cook the other side (about five more seconds). This softens the shells just enough. Now with the tongs flip it over again and bend the tortilla into a taco shape and hold for seven seconds. When it is crisp turn it over to crisp the other side about seven seconds. Place a generous amount of potato filling in each tortilla. Serve with your favorite salsa. The movie “Back to the Future” loops through my head more and more as I grow older. The notion of time moving in a ‘ever new’ way and only going forward is simply unreal or so it seems. So far my story might not be making you hungry but we will get there. It’s only a matter of yes, time. If you’re like most people, you can be transported to a dream state when eating peanut butter. If you’re like me, the dream is a long one and involves various forms, stages of life, battles with a sibling over who got the last spoonful, issues of textures and the divination of the knife’s scrapings on the clawed bottom of an empty jar.